This Easy Cheesy Chicken Spaghetti Casserole Recipe is a delicious Southern classic. 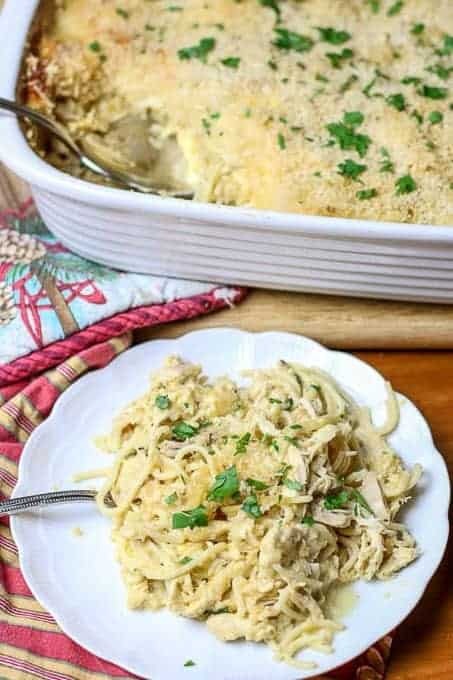 Chicken Spaghetti Casserole, also known as Chicken Tetrazzini is a creamy, cheesy, tasty pasta dish. It is loaded with a chicken, cheese, and a cream sauce, then topped with a cheesy panko crust. It is the perfect comfort food for the entire family that everyone is sure to love. In the South, we love our Chicken Casseroles. My Mother-in-law makes a delicious one with a crunchy, buttery ritz cracker crust. It is one of her recipe staples that our whole family loves. Her recipe will be coming soon. This chicken casserole is a little different. 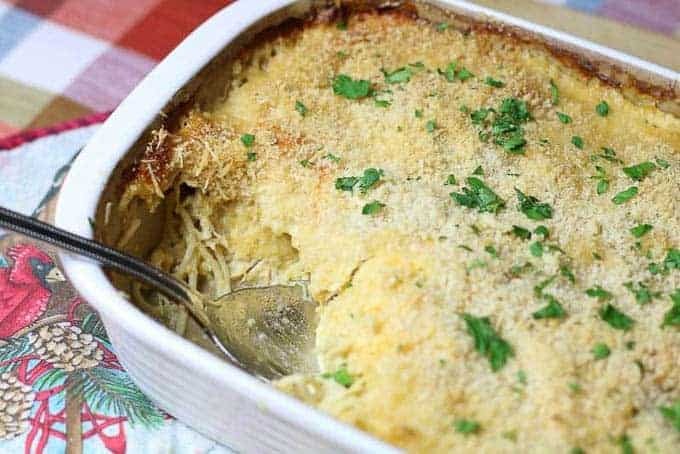 It is baked like a spaghetti casserole with loads of chicken, a white cheesy cream sauce, and topped with a crunchy cheesy panko crust. It is wicked good! Each bite is loaded with comfort and flavor. It is a “Feed Your Soul” kind of meal. My family absolutely loves it. It also makes a great freezer meal. If you like this recipe, check out: French Onion Chicken Noodle Casserole, Hash Brown Casserole, and Southern Cheesy Baked Spaghetti. 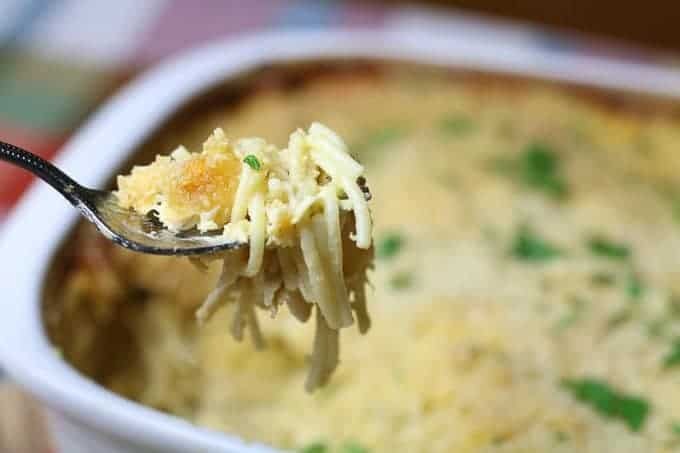 Chicken Spaghetti Casserole, aka Chicken Tetrazzini is a creamy, cheesy pasta dish. It is topped with a cheesy panko crust & makes the perfect comfort meal. Grease a 9 x13 inch baking dish. Mix sour cream, butter, chicken broth, Cream of Chicken Soup, salt, cayenne pepper, and cheddar cheese. Add in chicken and spaghetti, mixing well to be evenly distributed. Mix panko breadcrumbs and Parmesan cheese. Top mixture over the spaghetti. Bake uncovered 45-60 minutes until topping is crispy and inside is bubbly. This looks like comfort food at it’s best. I can’t wait to try – I bet this is a recipe my whole family will love. I have never done it before, but I imagine it would not be a problem. Do not add the breadcrumb and parmesan cheese topping until you cook it. It would become soggy if you add it early. Can you make this recipe the night before and then cook it the next day. Or do you need to go ahead and cook it then heat it up the next day for lunch? Mmmm looks very very tasty! I bet my husband would want a HUGE helping of this! He’s a casserole dude!